We all know Nissan's GT-R is pretty receptive of mods and quite a few already have more than 1,000bhp. Seems like someone needs more. This particular example has 1,700 horses and probably enough torque to turn the earth. 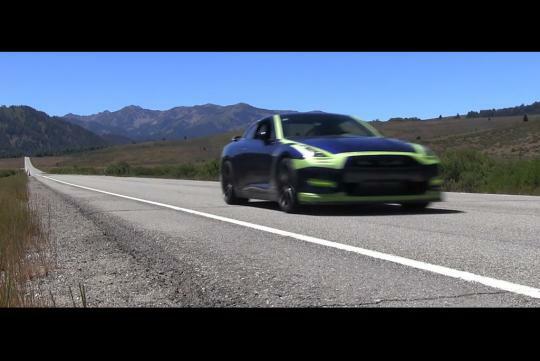 Where else better to unleash it than at Sun Valley Road Rally 2014 in Sun Valley, Idaho where it was clocked doing nearly 380km/h. And it seems like it has more potential considering it was hitting the rev limiter as it flew by in the video around the 55 second mark. Want fast? Go watch F1. All the cars fly pass at 300kmh+ too. WOW. But I'm not blown away. at least it didn't burn to the ground like the NSX.. It went so fast that the sound couldn't catch up with it!! !